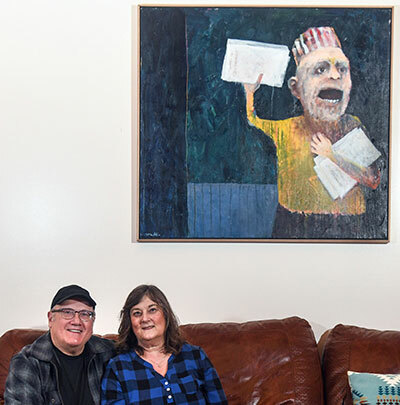 Former SR columnist Doug Clark and wife, Sherry (pictured above), just published an art book about Mel McCuddin and his work. As owners of several of his paintings, they love the quirky, strange, and whimsical glimpses of life that he captures. Collaborating with McCuddin on this book has been a labor of love, and the Clarks are honored that he is thrilled with the final product. • Wow! The Inner Eye is a fabulous tribute! • So glad you've done this book. We're big fans of Mel, his work, and painting titles. • Just received the beautiful book on Mel McCuddin. Thank you so much for making the book available. • Loved learning more about Mel. The pictures are spectacular! • What an A++++++ job! Wonderful and accurate photographs, and excellent visual and physical presentation. Kudos. McCUDDIN: The Inner Eye showcases six decades of the artist's favorite works, with some 300 images in full color. The book also tells the backstory of how a humble milk delivery man grew into one of the Inland Northwest's most respected artists. There are sections on McCuddin artwork in public places as well as personal stories from owners (including Ed. Clark and Mary Christen.) It's a large book - 10x12 inches and 192 pages, all in full color on high quality paper. This is a limited edition of just 500 copies. The book sells for $125, which includes shipping and a complimentary print of the cover art, Confusion at the Gate. In addition, all copies are signed by the artist. Check out the website, clarksvillepublishing.com for a glimpse of McCUDDIN: The Inner Eye and to learn how to get a copy of your own.